Plan ahead and enjoy your guests with this easy, make-ahead brunch menu, recipes and planner. Try these delicious brunch recipes! 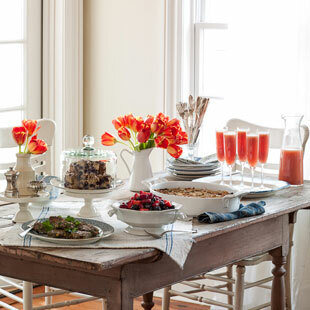 Whenever you're gathering family and friends, serving brunch is a great way to celebrate. And when you plan and make the meal ahead, you can enjoy the party along with your guests. Download a FREE make-ahead brunch planner. Make berry puree (Step 1) and lemon sauce (Step 2) for Very Berry Fruit Salad and refrigerate. • Make Sunrise Bellini mix (Step 1) and refrigerate in an airtight container. Freeze-ahead instruction: Freeze airtight for up to 1 month; thaw overnight in the refrigerator. • Prepare egg mixture (through Step 1) and vegetables (Steps 2-5) for Prosciutto & Asparagus Strata; cover and refrigerate. • Prepare Pistachio Breakfast Sausage Patties (Steps 1-2) and refrigerate. Freeze-ahead instructions: Individually wrap and freeze for up to 3 months; thaw overnight in the refrigerator before cooking. • Bake Pecan-Berry Coffee Cake (Steps 1-5) Cool, cover and hold in the pan at room temperature. • For Very Berry Fruit Salad, remove berry puree and berries (if refrigerated) from the refrigerator to bring to room temperature. • Remove the strata egg mixture and vegetables from the refrigerator so they can stand at room temperature for about 1 hour before you assemble and bake (Step 6). • Assemble and bake the strata (Steps 7-9). • Combine Puree and berries for the fruit salad (Step 3); let stand at room temperature until serving. • Cook sausage patties (Steps 3-4); keep warm in a 300°F oven. • Unwrap the coffee cake and reheat (whole) in a 300°F oven. • Finish and garnish the fruit salad (Step 4). • Finish the Bellinis (Step 2).